A delightful back in time over these genuine steps. Sumptuous Dravidian temples to former colonial trading through the lush tea plantations and spice gardens of Kerala. Continuation in Karnataka where the Back to the Future is obvious from its ruins of lost kingdoms and Silicon Valley. Tamil Nadu and Kerala, it is both the mix of sumptuous Dravidian temples, Christian churches and synagogues. 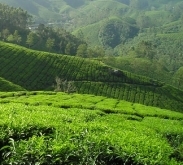 These are also beautiful landscapes with bright colors, tea plantations of sight and tropical vegetation. 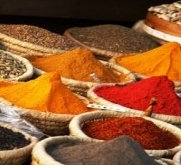 This is also the land of spices where pepper and cinnamon compete with cardamom and ginger. Be seduced by the sweet life of Kerala. Eden home to sandy beaches fringed with coconut palms, tea plantations and coffee in the highlands where the green comes to infinity. On the hills, banana, mango, pepper and lower rice fields between land, sea and lagoon. Authenticity and tradition are the charm of Kerala. Some Indian facets allow themselves discover in this trip. The ancient India in the former princely state of Mysore where slumber the first stone works; Today simple witnesses to the power of the missing kingdoms. 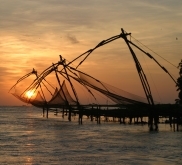 Maritime India in the heart of the route of the ancient trade routes and India landscapes of great diversity and lush. On the one side to the other in this deep and fervent India. Christian Kerala India, colonial counters, dance dedicated to the gods but also India traditions, temples, cities dedicated to Hindu deities, ancient kingdoms and their remains.